This is the third book from the brilliant team behind Little Button Diaries and just like The Knight and The Princess Craft Books it doesn’t disappoint. The book provides a wealth of inspiration for original, on trend crafty projects to do with your children. There were loads which I thought were simply brilliant as they were so original but on reflection so simple and basic I couldn’t believe I hadn’t thought of them myself. My favourite has to be the pegboard Giant Cross Stitch Art project, this is a lovely project for children and adults alike. I must admit, I’m going to have a go myself. The idea of using a pegboard is so simple but so very effective, not only for children but also perhaps for those who have difficulties being accurate with their hands. Of course, the end result would also look stunning on the wall. There are lots of projects contained within the book which require minimum outlay in terms of the equipment needed. I loved the Foldaway Cardboard Boat project which although nothing unusual in conception at least (who hasn’t turned a cardboard box into something?) provided the measurements to makes something stunning. The book is nicely presented, it looks good and is well laid out with loads if images (these are essential when crafting) and clear sections which also detail the sorts of skills your child will learn if participating in these different projects. Again Laura and Tia have produced a book which is very difficult to fault. If you enjoy doing crafts with the kids as I do, this is a fabulous book to have sitting on your shelf at home and it comes highly recommended from me. In fact, chuck out those old dated craft books and treat yourself! Watch out for some of our crafty makes from this book on my Instagram. 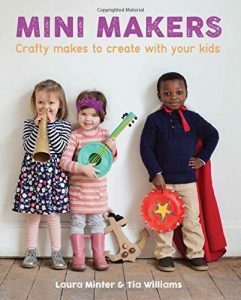 Mini Makers is published by GMC and you can find out more here.